One of the themes promoted by the BBC in its coverage of the Israeli prime minister’s recent address to the US Congress was that the speech was connected to the upcoming elections in Israel. “At the White House they will probably be watching in spite of themselves – but through gritted teeth. “One of Mr Netanyahu’s advisors, Dore Gold, says the timing is nothing to do with Israel’s election – it is just that Iran is an important issue on which Mr Netanyahu has important things to say. 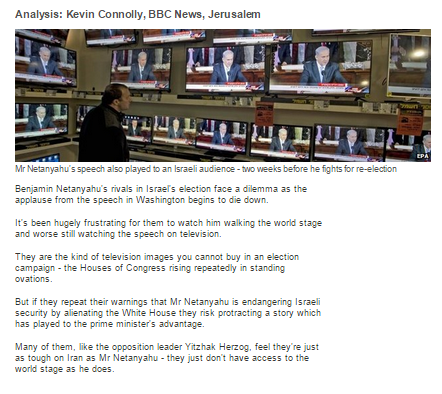 The March 3rd article titled Israel’s “Netanyahu warns US against ‘paving way to Iran bomb’” told readers that: “The speech comes just two weeks before a closely fought election in Israel” and included the following insert of analysis from Kevin Connolly which clearly ties the topic of Netanyahu’s speech to Congress with the Israeli elections. That same insert of analysis also appeared in the report titled “Obama says Netanyahu’s Iran speech contains ‘nothing new’” published on March 4th. “Well, I think it was very useful for his own…err…err…reelection campaign. Two weeks off before the voters in Israel make a decision. He’s actually this week trailing in the polls behind his main rival, Isaac Hertzog, and he’s got a problem with the president of the United States which normally the Israeli voters don’t like: a prime minister who can’t handle his relationship with the president. But now he’s got a photo – and it was streamed live to Israel – of ‘the Congress has got our back and I know how to talk to the Congress and everything will be alright’. “According to polls carried out by Israeli TV news channels Wednesday, the day after his high-stakes speech to Congress, Netanyahu’s address had only a modest influence on the Israeli electorate. Israel’s Channel 2 news said Netanyahu’s Likud party had increased its likely support by one seat in the parliament. On rival Channel 10, Likud had gained two seats to tie its main challenger. “Prime Minister Benjamin Netanyahu’s speech to the US Congress did not help his Likud party cut the Zionist Union’s two-seat lead, according to a Panels Research poll taken on Wednesday and Thursday forThe Jerusalem Post and its Hebrew sister publication Maariv Sof Hashavua. It is worth remembering that this is not the first time that the BBC has misled its audiences by fabricating connections between elections in Israel and separate events. So Netanyahu’s ‘ploy’ didn’t work … doesn’t mean that it wasn’t a ‘ploy’. Only if you ignore completely the looming US pact allowing Iran’s nuclear weaponization can you even think this was an election ploy. The deadline for Iran pact is March 24, right? US negotiates with Iran even as Iran openly declares its intention to does Israel. Even NOT ignoring a pact I still think it was an election ploy (prob. the same speech from all those years ago ‘phrophesising’ doom and gloom). You’re not alone, regrettably, but on what grounds do you base that “thought”? With a March 31 deadline for Obama to get his nuclear pact done with the untrustworthy, evasive and avowedly genocidal Iran, do you think Netanyahu would not have gone to address congress if there were no Israeli election afoot? That’s what you’re saying. He went because of the election. I see no evidence for that whatever, just a lot of anti-Netanyahu “gut instincts.” As for his earlier prophecies, one reason Iran hasn’t yet got a bomb is that it was slowed down by the sanctions that came about as a result of Netanyahu’s previous warnings. From our distance it’s easy to say he’s crying wolf but living under the gun as Israel is, they can’t afford to underestimate Iran. He went because of the election. ” living under the gun as Israel is”? … living BY the gun, surely. sorry, that “does” should have been ‘destroy.’ fat fingers. That’ll be the boxing gloves then. Wasn’t it you that accused this site of nit picking? Any normal person can teach you the melody. Put your own anti-Zionist troll lyrics to it. As could you … were you normal. I enjoy the company of people who are not anti-Zionist nor anti-Jewish. I suspect that you as a good left-winger don’t and prefer anti-Zionist trolling. .
You probably have friends who are neither anti-Zionist nor anti-Jewish. There are, I would hope, among them people who are anti-Israeli occupation and brutality. If i were to discover any anti-Semites on my list of friends , I would of course delist them… and have done. If I’d known about you in time, I could have passed them on to you. You must be quite busy being opposed to occupation and brutality. Where does Israel score on your list? I usually find that anti-Zionists are happy with a list of one place… and don’t actually need things like occupation and brutality to excite their interest. Seems you are non-committal on a view of ‘anti-Israeli occupation’. You only mention anti-semites and anti-zionists. Colin, he means the occupation of Israel by Jews, that’s what he’s “anti”..
He’s not at all interested in other occupations such as Turkey’s occupation of Northern Cyprus, or China’s occupation of Tibet, to name but two. Colin, he means the occupation of Palestinian land by the Israeli military allowing ‘Israeli would be citizens’ to destroy Palestinian villages, crops and livelihoods by their illegal settlements and ‘outposts’…. 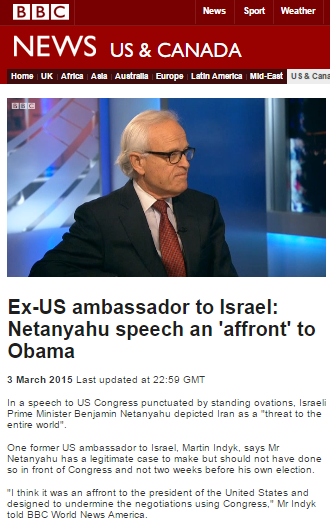 that’s what he’s “anti”.. like he said, ‘anti-Israeli occupation’. He’s also against the Israeli gov. philosophy of ‘Might is right’. He is concerned re. the other occupations … but this one has only been possible with the aid 🙂 / support of America and should be able to be reigned back by The West. Were you ever anti the Jordanian occupation of the West Bank and Jerusalem, or the Occupation of the Gaza Strip by Egypt? Time for new song, folks, to the tune “Colonel Bogey” ‘Farmer… has only got one eye, / With it… he can no fault descry, / Except… when watching / The damn Jews… go by. etc etc . Even when destroying homes and lives, Israel is ALWAYS the victim?